15 A None No Power Seat 15 A is a standard Business class seat however, the proximity to the lavatories and galley may be bothersome. 15 C None No Power Seat 15 C is a standard Business class seat however, the proximity to the lavatories and galley may be bothersome. 15 D None No Power Seat 15 D is a standard Business class seat however, the proximity to the lavatories and galley may be bothersome. 15 G None No Power Seat 15 G is a standard Business class seat however, the proximity to the lavatories and galley may be bothersome. 15 H None No Power Seat 15 H is a standard Business class seat however, the proximity to the lavatories and galley may be bothersome. 15 K None No Power Seat 15 K is a standard Business class seat however, the proximity to the lavatories and galley may be bothersome. 16 A None No Power Seat 16 A is a standard Business class seat however, the proximity to the galley may be bothersome. 16 C None No Power Seat 16 C is a standard Business class seat however, the proximity to the galley may be bothersome. 16 D None No Power Seat 16 D is a standard Business class seat however, the proximity to the galley may be bothersome. 16 G None No Power Seat 16 G is a standard Business class seat however, the proximity to the galley may be bothersome. 16 H None No Power Seat 16 H is a standard Business class seat however, the proximity to the galley may be bothersome. 16 K None No Power Seat 16 K is a standard Business class seat however, the proximity to the galley may be bothersome. 31 A None No Power Seat 31 A is a standard Economy class seat that may have restricted legroom. The position of the bassinets may be bothersome. 31 B None No Power Seat 31 B is a standard Economy class seat that may have restricted legroom. The position of the bassinets may be bothersome. 31 C None No Power Seat 31 C is a standard Economy class seat that may have restricted legroom. The position of the bassinets may be bothersome. 31 D None No Power Seat 31 D is a standard Economy class seat that may have restricted legroom. The position of the bassinets may be bothersome. 31 E None No Power Seat 31 E is a standard Economy class seat that may have restricted legroom. The position of the bassinets may be bothersome. 31 F None No Power Seat 31 F is a standard Economy class seat that may have restricted legroom. The position of the bassinets may be bothersome. 31 H None No Power Seat 31 H is a standard Economy class seat that may have restricted legroom. The position of the bassinets may be bothersome. 31 J None No Power Seat 31 J is a standard Economy class seat that may have restricted legroom. The position of the bassinets may be bothersome. 31 K None No Power Seat 31 K is a standard Economy class seat that may have restricted legroom. The position of the bassinets may be bothersome. 39 A None No Power Seat 39 A is a standard Economy class seat that may have limited recline. The proximity to the lavatories may be bothersome. 39 B None No Power Seat 39 B is a standard Economy class seat that may have limited recline. The proximity to the lavatories may be bothersome. 39 C None No Power Seat 39 C is a standard Economy class seat that may have limited recline. The proximity to the lavatories may be bothersome. 39 F None No Power Seat 39 F is a standard Economy class seat that may have limited recline. The proximity to the lavatories may be bothersome. 39 J None No Power Seat 39 J is a standard Economy class seat that may have limited recline. The proximity to the lavatories may be bothersome. 39 K None No Power Seat 39 K is a standard Economy class seat that may have limited recline. The proximity to the lavatories may be bothersome. 40 A None No Power Seat 40 A is a standard Economy class seat that has extra legroom however, the protrusion of the exit door and proximity to the lavatories may be bothersome. The tray table is in the armrest, making the armrest immovable and slightly reducing seat width. 40 B None No Power Seat 40 B is a standard Economy class seat that has extra legroom. The proximity to the lavatories may be bothersome. The tray table is in the armrest, making the armrest immovable and slightly reducing seat width. 40 C None No Power Seat 40 C is a standard Economy class seat that has extra legroom. The proximity to the lavatories may be bothersome. The tray table is in the armrest, making the armrest immovable and slightly reducing seat width. 40 D None No Power Seat 40 D is a standard Economy class seat that has extra legroom. The proximity to the lavatories may be bothersome. The tray table is in the armrest, making the armrest immovable and slightly reducing seat width. 40 E None No Power Seat 40 E is a standard Economy class seat that has extra legroom. The proximity to the lavatories may be bothersome. The tray table is in the armrest, making the armrest immovable and slightly reducing seat width. 40 F None No Power Seat 40 F is a standard Economy class seat that has extra legroom. The proximity to the lavatories may be bothersome. The tray table is in the armrest, making the armrest immovable and slightly reducing seat width. 40 H None No Power Seat 40 H is a standard Economy class seat that has extra legroom. The proximity to the lavatories may be bothersome. The tray table is in the armrest, making the armrest immovable and slightly reducing seat width. 40 J None No Power Seat 40 J is a standard Economy class seat that has extra legroom. The proximity to the lavatories may be bothersome. The tray table is in the armrest, making the armrest immovable and slightly reducing seat width. 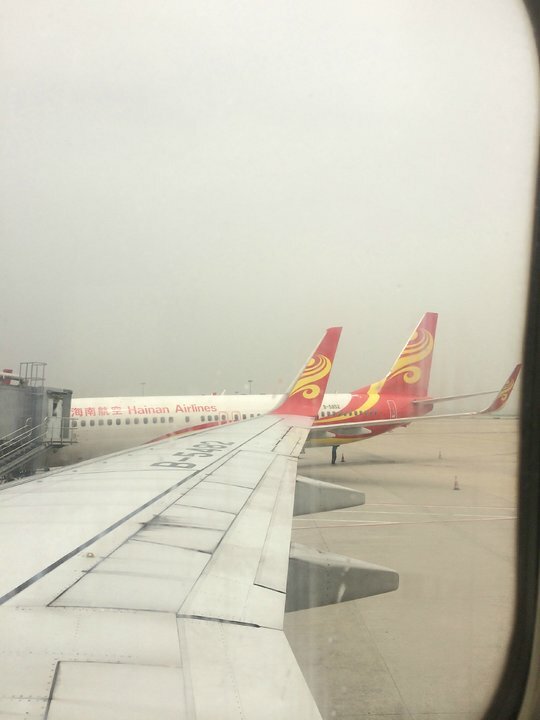 40 K None No Power Seat 40 K is a standard Economy class seat that has extra legroom however, the protrusion of the exit door and proximity to the lavatories may be bothersome. The tray table is in the armrest, making the armrest immovable and slightly reducing seat width. 50 A None No Power Seat 50 A is a standard Economy class seat that may have limited recline. 50 C None No Power Seat 50 C is a standard Economy class seat that may have limited recline. 50 F None No Power Seat 50 F is a standard Economy class seat however, the proximity to the lavatory may be bothersome. 51 D None No Power Seat 51 D is a standard Economy class seat that may have limited recline. The proximity to the lavatory and galley may be bothersome. 51 E None No Power Seat 51 E is a standard Economy class seat that may have limited recline. The proximity to the lavatory and galley may be bothersome. 51 F None No Power Seat 51 F is a standard Economy class seat that may have limited recline. The proximity to the lavatory and galley may be bothersome. 110v AC power ports are available at all Business and Economy class seats. There are also USB ports available in Business. 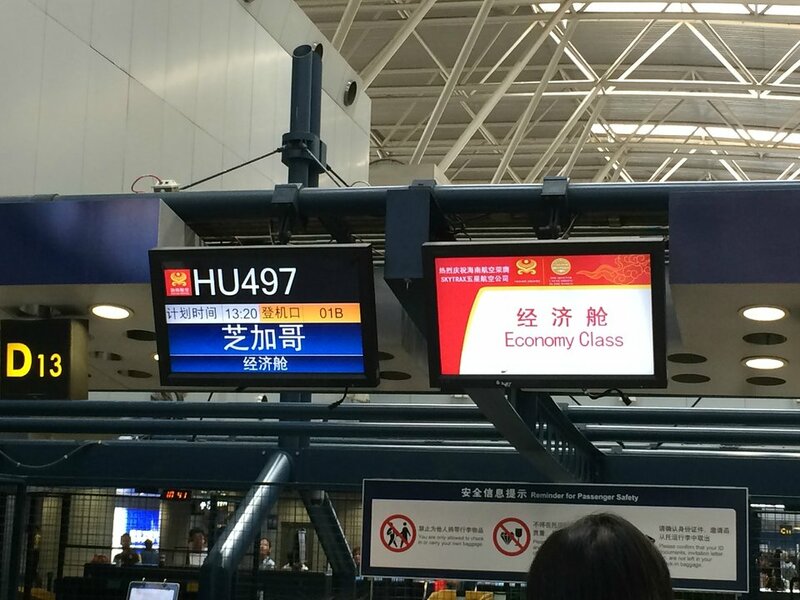 Hainan Airlines' Boeing 787-8 is flown in a two class configuration with 36 flat bed Busniess Class seats and 177 standard Economy Class seats. Good airline however if you are going to sit in a window seat you are going to be cramped, especially if it's an emergency exit row. Go for any other aisle seat. 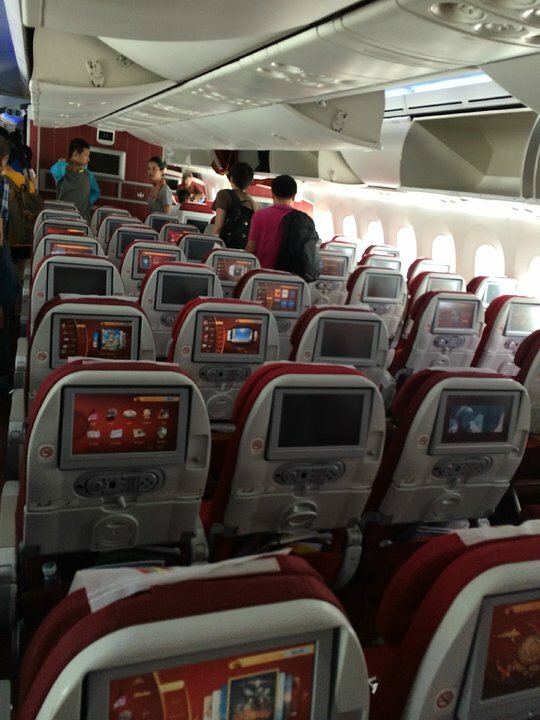 Note that TV screens fold away for takeoff and landing. 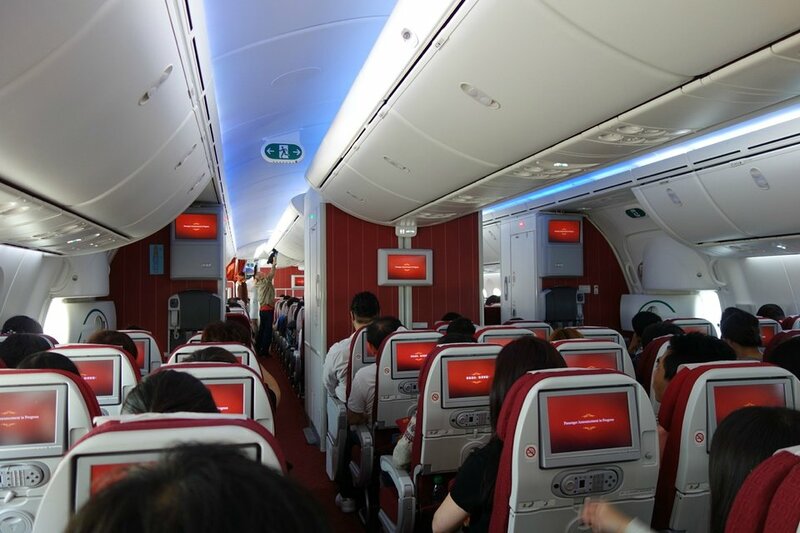 This means you will have 15-30 minutes less viewing time at landing vs. other seats. Not a big deal, but worth noting. The seat is narrow for a large person, but there was enough legroom. Even with the seat in front of me reclined, I still felt I had enough room. Not really great for a 12 hour flight, but better than some I have had! Seat was great! Lie flat seat was wonderful for 12 hour flight. Plenty of room in the seat and on the armrest. free leg room. but you need to take care of emergency exit. 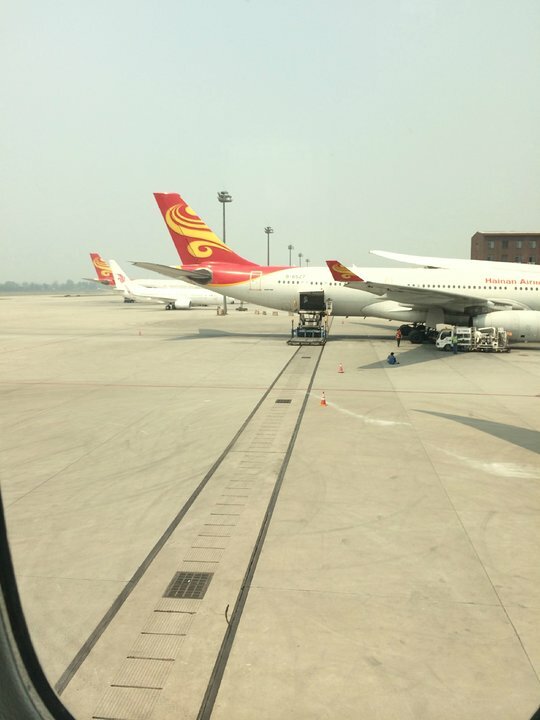 Hainan Airlines flies 1 versions of Boeing 787-8 (788).